Trying to explain how to implement Best Management Practices (BMPs) on forestry operations can be challenging without the help of good visual aids. Showing good examples of BMPs on-the-ground can go a long way towards understanding the concept of BMPs. and Rendezvous Mountain Educational State Forest near Wilkesboro. 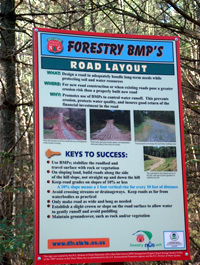 These demonstration areas show real-world examples of everyday BMPs that are appropriate for forestry activities. In forestry, the use of BMPs focuses on the protection of water quality, usually through soil erosion and conservation practices. tips for successful BMP installation. A brochure is available at each demonstration trail to further explain how BMPs can be used during forestry work to protect water quality. This project was funded by a U.S. EPA Nonpoint Source Management Program 319-Grant.